"It's important to be open-minded, but not so open-minded that your brains fall out"
" Is it possible to suffer a misfortune or a harm of which we are completely unaware? At first sight the idea seem ridiculous. It's like someone telling you they have just discovered that yesterday they had been suffering a toothache all day but were quite unaware of it at the time! ..."
Thought Bubbles (TBubbles) are short reflective essays (between 500 and 800 words) on a wide variety of topics by a wide variety of writers. 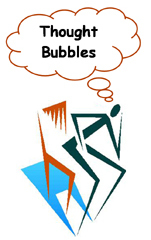 The sole purpose of TBubbles is to stimulate dialogue, discussion and debate. How often are TBubbles published? We publish about two TBubbles a month. So visit this site regularly or subscribe by email. it will always deal with an issue that is focussed, specific and relates broadly to our human condition. Words of this kind tend to make for very abstract, and consequently woolly and obscure thinking. 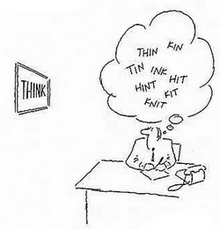 In Thought Bubbles we are seeking to promote clear, considered and, hopefully, relevant reflection. May I comment on a TBubble if I agree or disagree with it? Yes. If you click on the link in the TBubble index you will see a link below the TBubble labelled "Comments". Click this link and you will get a box in which you can type your response. You do not have to log in or identify yourself in any way. Please feel free to comment on any of the TBubbles published via this site. May I Subscribe to TBubbles? Yes - Just send an email to the Bubble Master containing the word "Subscribe" and we will send each TBubble direct to your inbox as it is published. May I contribute a TBubble? If you would like to contribute a TBubble HERE is a list of possible topics for you to consider. These are just to give you a flavour of the "type" of topics we are looking for. You can offer a different topic if you like. You can even write on a topic that someone has already covered if you have a different angle on it. You don't have to be a member of Sea of Faith or even sympathetic to its views to contribute a Thought Bubble. This site is sponsored by SOF but is not a platform for its views. � Copyright 2007. All rights reserved.